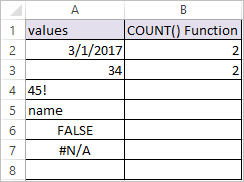 COUNT Function in Excel returns the count of values in the cell which has only number or date values. In other words, COUNT Function count the cells only if the cells have number or date values in it. Arguments, value1, [value2], etc. can be values or references to cell ranges. The numbers and the date 03/01/2017 are counted by the count function. The text value “name”, the logical value FALSE, TRUE and the error value #N/A, #VAL! are not counted by the count function. The empty cells are not counted by the count function.